Blackjack Review: The ultimate blackjack card counting strategy site! Since 1996, Blackjack Review could be found at BJRnet.com. 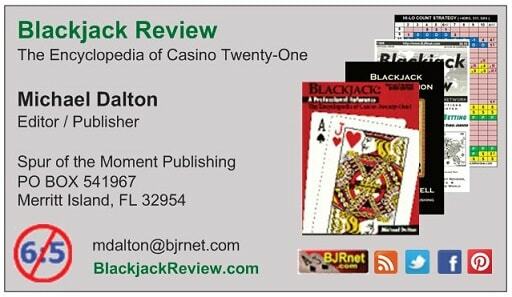 In 2016, we moved to this improved and secure WordPress site and began using the BlackjackReview.com domain. Blackjack Review magazine was published from Summer 1992 to Winter 1998. Past issues may still be available. The term 6:5 is an abbreviation for a game in which naturals are paid only 6 to 5. This is not only a sucker bet, but they are cheating you in plain site. A natural blackjack is meant to be paid at 3 to 2. DO NOT PLAY in these games! For more information check The Numbers of 21 section. Reload page to get the latest! 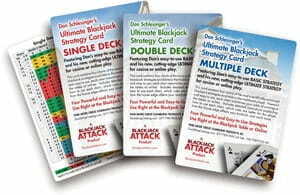 In addition to basic strategy information, you will find a complete card counting school curriculum with tests and quizzes, frequently asked questions, blackjack and card counting strategy videos, blackjack and advantage play blog feeds, historical rules and conditions, archives, recommended links and the history of the game. You will even find links to some free games and online casino reviews, as well as blackjack casino sites that accept Boku payments. 3) Yes, all online content here is free. There are no memberships to join or fees to enter special areas on the site. To help pay the rent, we do have a few affiliate ads and sponsors. The site owner, Michael Dalton, has had a love and passion for the game since the 1980s. You can help him keep this site free by becoming a site sponsor, purchasing a product from our catalog, or by making a donation. Card counting is an advantage play technique. It is a method of keeping track of the cards by assigning a value to certain cards in the deck. The theory behind card-counting is based on the fact that when a deck or shoe is deficient in small cards the player is at a greater than normal advantage and when the deck or shoe is deficient in high cards the player is at a less than normal advantage. Is there such a thing as “the best card counting system“? Although card counting is a technique that can increase your odds of winning at blackjack, it can’t be applied at most online blackjack sites where cards are shuffled every time and there is no deck penetration. The game of blackjack and online gambling is enjoyed worldwide. As an example, Japanese people love blackjack, but they are also crazy about カジノスロット (different kinds of casino slots). The Blackjack Review Network supports all other sites and experts that provide sound and mathematically justified ideas about the game of blackjack and advantage play. If there is better information available elsewhere you will usually see a link to it here along with a glowing endorsement. We are not owned or controlled by any casino operation and are devoted to providing honest and accurate information that players can use to beat (i.e., gain a theoretical advantage in) today’s tough casino games. Feedback and suggestions are always welcome. Be sure to check out our product catalog – currently undergoing a 20% to 80% off clearance. This may be your last chance. Except for a few items, when our product inventory is gone, we will not be restocking it! Many items are being sold at “below cost”. Our catalog includes gambling books, reports, software and videos from the top experts in their field. Blackjack experts include John Auston, Norman Wattenberger, Bryce Carlson, Stanford Wong, Arnold Snyder, Eliot Jacobson, Max Rubin, Michael Shackleford, Richard Munchkin, Henry Tamburin, Bill Zender, Steve Forte and Peter Griffin. Poker experts include Lou Krieger, Mike Cappelletti, Mike Caro, Roy Cooke, Lee Jones, Doyle Brunson, Tom McEvoy, T. J. Cloutier, David Sklansky, Mason Malmuth. Video poker experts include Bob Dancer and Dan Paymar. Our blackjack software recommendations include Norm Wattenberger’s Casino Verite, Victor Shelley’s Ne Plus Ultra and SmartCards by Extreme Blackjack. Need a good set of casino type poker chips? We have that too! Interested in baccarat? Check out Dennis Suggs’ Baccarat Buster software that allows users the ability to define any casino shuffle and practice or simulate baccarat playing strategies. ORDER YOUR BASIC STRATEGY CARDS NOW! 3. ↑ Yes, all online content here is free. There are no memberships to join or fees to enter special areas on the site. To help pay the rent, we do have a few affiliate ads and sponsors. The site owner, Michael Dalton, has had a love and passion for the game since the 1980s. You can help him keep this site free by becoming a site sponsor, purchasing a product from our catalog, or by making a donation.